It is hard to take in, there must be another reason they are carrying out these inhumane acts? Is there an alien being controlling parliament? Is there no way we can send in a drone and eliminate the species? No – there are many more like him at home. If you make them angry they may swarm. How is it possible for a man to become so deluded & so far removed from the reality of what’s going on around him, then be allowed to head an essential govt Dept. Cameron must remove this ill informed megalomaniac before he adds to the considerable damage he’s already done.How many more people must die because of his own & his dept sheer incompetence now? IDS is a dangerous man. He failed in the Tory leadership, he’s failed & hurting many good, honest, decent lives, irreparably now! Mr Cameron please wake up, its not anyone else’s fault! Cameron is part of the problem. That idiot Duncan Smith is just a shield to deflect flack from Cameron and his equally moronic “Chancellor”. Of course those shadowy corporate interests that pull Cameron and Osborne’s strings are ultimately responsible. Corporate manslaughter at the very least. Why and how can these people escape being charged by police? It’s quite frankly embarrassing to all Christians that IDS and DC identify themselves as any denomination. This is just another veiled attack on the Trussel Trust by a person clearly ignorant of Jesus’ teachings, and indeed, those of the Holy See. IDS is a man in error, and whatever his excuse for that error, it doesn’t lessen it. I’m voting for the Jewish bloke, then , maybe, we’ll see a decline in foodbank use, but it will take years, if not decades, thanks to those two faux christians and their cabal of millionaires. I won’t add the above comments,other than to say how i agree with Mike’s piece,and the sentiments of the other people whose comments i agree with totally,the man is a hypocrite. Last October, the food bank at Camborne in Cornwall, (which is not Trussell Trust,) handed out food parcels for 19000, (yes nineteen thousand) people in one day. Local average pay, £14500 a year, local average private rent £800 a month. Whilst the national benefit cap has hit many people in Cornwall, the perfect storm of other benefit cuts/delays have hit hard. You know what? That doesn’t surprise me. I studied journalism at Pool College (between Camborne and Redruth) so I’m familiar with the area. Is this the Oxfam view you refer to? http://policy-practice.oxfam.org.uk/our-work/poverty-in-the-uk They claim “13 million people in the UK do not have enough to live on,” or http://policy-practice.oxfam.org.uk/publications/multiple-cuts-for-the-poorest-families-175-million-of-the-poorest-families-have-315868 ” For a second year in a row, benefits values have increased below prices. At the same time, council tax support and housing benefit have been cut for 1.75 million of the poorest families in the UK.” These look like good figures to me. I think it’s the first of your quotes – if it came from the ‘Below the Breadline’ report that is referenced right next to it on the web page. 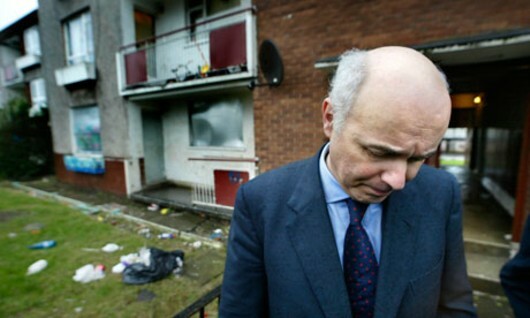 Does Iain Duncan Smith have to insist on increasing both their number and their plight? Then it can’t have been Jesus who said it. He doesn’t turn up until the New Testament (unless you’re counting the incident with Nebuchadnezzar and the furnace). I wonder if IDS thinks the same thing about the miracle where Jesus fed the multitude with seven loaves and fishes. Just trying to drum up a bit of business for himself was he? So not The Department for Work and Pensions or Ian but Neil? Where does ‘more to do with’ come from? What is that based on? How does: ‘For the Trussell Trust, food banks started as an evangelical device to get religious groups in touch with their local communities’ turn into: ‘Iain Duncan Smith blames rise of food banks on ‘evangelism’? The monkey does what the organ-grinder tells him to do. Even the quote you use doesn’t seem to back up your ascertion: blames rise of food banks on evangelism. He seems to be talking about why they started food banks not why they are increasing. As for: Department for Work and Pensions has caused the deaths of thousands upon thousands of innocent people. If you can’t explain the twisted article, fair enough. I’m not going to bother explaining it. It makes perfect sense. I think you are merely trying to cause trouble by nitpicking. It is not about nit-picking. You are saying one person is saying something which they seemingly did not. Using a quote inappropriately and seemingly twisting words. You are just not being honest IMHO. And you are being disingenuous. Neil Couling said the words because it is his job to say them; he is repeating current DWP policy. That policy is dictated by Couling’s boss, Iain Duncan Smith. Therefore he is saying what Iain Duncan Smith wants him to say. This is not an argument that depends on me saying two different things are the same; it is an argument that points out the direct relationship between what Iain Duncan Smith wants and what his employees do. Or are you saying that Mr Couling went rogue and was spouting off-script comments? That would be a disciplinary offence and we haven’t seen any evidence of such action being taken against him, have we? Of course not. I don’t think I’ll be accepting any more comments from you on this issue. Food banks are here because the government is being really unpleasant towards not just the unemployed but the disabled and the low-paid. Where is the road sign that says Food Bank in a town? What would the point be, when you need a voucher and you cannot get a voucher if you have been sanctioned off benefits, lost or never gained them? I’ve edited your comment right down again because you still appear not to have grasped the idea that a comment should not be longer than the article that prompted it. Also, I have already answered this question, which is based on a false premise. Working people can get food bank vouchers; if you are in hardship, then a referrer will send you to a food bank.